George Enescu’s use of elements of Romanian traditional music is well known; his most popular works today, the Rhapsodies roumaines, attest to his enthusiasm for his homeland’s music. Less known is his interest in the Turkish melodic type makam (pl. makamlar) and its influence on his masterpiece, the opera Œdipe. In this work, Enescu used three makamlar: Müsteâr, for music associated with the characters Creon and Jocasta; Hisâr, for the motif of fate, and Nişâbûr, for the motif of justification. This according to “Modale Strukturen in Annäherung zur orientalischen Kirchenmusik im Oedip von George Enescu” by Adriana Şirli, an essay included in Enesciana II-III: Georges Enesco, musicien complexe (Bucureşti: Editura Academiei Republicii Socialiste România, 1981). 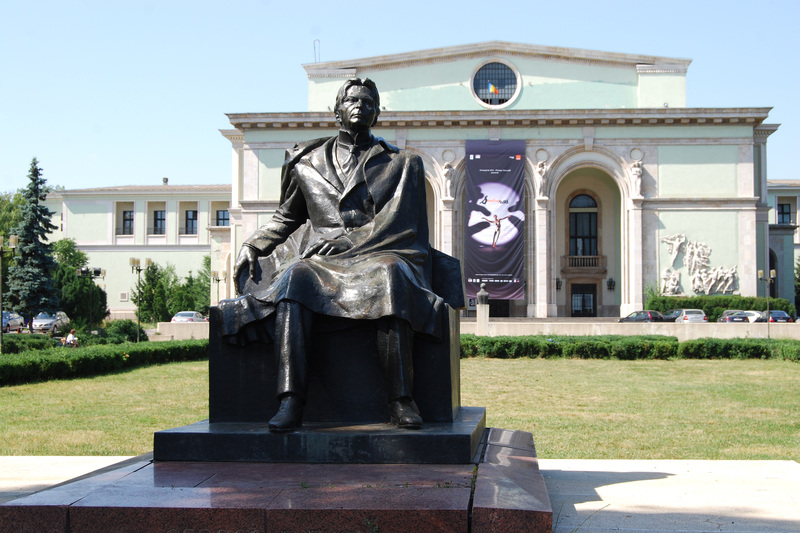 Today is Enescu’s 130th birthday! Below, an excerpt from the 1970 production of Œdipe by the Opera Naţională Bucureşti; above, the Enescu statue in front of the opera house. For more Enescu iconography, see Music on money.